Here are some things that we do as a community of faith. Summer worship in the garden. One of the most important things we do as a community is worship together. Worship forms us as people of God. Our worship style is a blend of traditional and contemporary sounds and practices. Many of us dress casual for worship. Click here for more information on our worship. We take seriously our calling to serve, care for and walk with our neighbor. Here are some ways we do that. The sanctuary during the season of Easter. The journey of faith is a journey of learning. We are always discovering new ways of thinking about and encountering God. Here are some ways that we learn together. 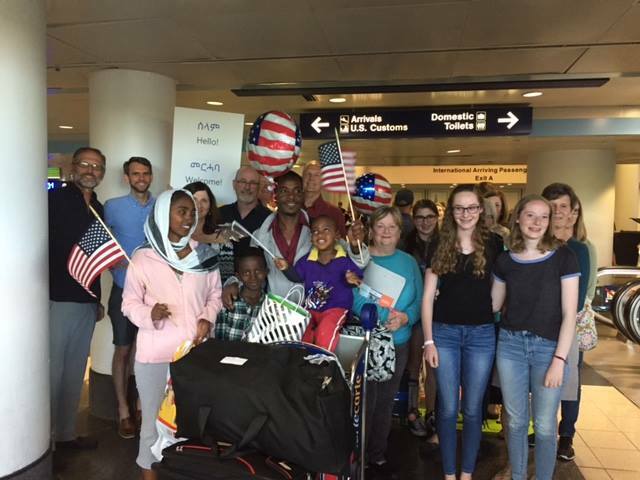 Greeting a new refugee family at the airport. One of our community's greatest gifts is hospitality. We take great pleasure in getting to know one another and providing opportunities to socialize and make human connections. Here are some of our favorite ways that we practice hospitality.